Published on June 26, 2012 in General T&T, Labour, MSJ, People's Partnership, PNM and Politics. 3 Comments Tags: Ancel Roget, Politics, Selwyn R. Cudjoe, T&T Govt. I don’t know Ancel Roget. I never met the brother until last Tuesday when I attended the Labor Day rally at Charlie King Junction in Fyzabad. I was impressed tremendously by his eloquence and force. His address was pitched directly to matters at hand and raised substantial questions. His address was stamped with his character and did much credit to the labor movement. 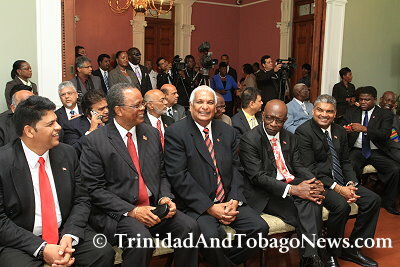 Published on June 26, 2012 in Finance, General T&T, Media, People's Partnership, Politics, THA and Tobago. 1 Comment Tags: Dr. Delmon Baker, Dr. Lincoln Douglas, Ganga Singh, Jack Warner, Jairam Seemungal, Jamal Mohammed, Kamla Persad-Bissessar, Keith Rowley, Larry Howai, Marlene Coudray, Politics, Prakash Ramadhar, T&T Govt, Winston Dookeran. Government’s parliamentary team has been strengthened with the appointment of veteran politician Ganga Singh as Senate leader, replacing Emmanuel George.